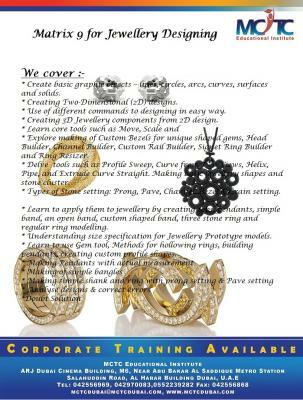 Are you looking for an advanced level Jewellery designing course to build your skills of designing? We at MCTC Dubai will teach you the practical aspects of designing and you will be able to adopt to new technologies when it requires. Matrix 9 and Rhinoceros are the new software that used for professional jewelry designing. We will teach you designing from the basic to advanced level. Visit us and take a free demo session, you will feel the exact difference. Take a walk to us, we are located in Deira, Dubai..